June-60 – sounds familiar, right? No you’re not mistaken. This pedal from TC Electronic is of course, an authentic recreation of a chorus from the synth that left an indelible imprint on the 80s – the Roland Juno-60. The June-60 from TC Electronic recreates the chorus from the archetypal 80s synth, the Roland Juno-60. It dishes up lush analog chorus that could not be easier to use. 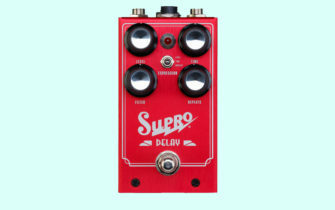 The pedal is based on the same analog bucket brigade circuitry as the synth. Its credentials are also enhanced by how closely the controls resemble the original too. All you have are two buttons – I engages a smooth and subtle wooziness, while II brings a deeper and faster wobble. Both in simultaneously offers up a slightly choppier tone that edges toward a rotary sound. Their is also a switch for mono or stereo connectivity (though for stereo, you’ll need a Y-split cable). For more info, visit the TC Electronic website.